Kick off your visit on the 10th (Wed): contemplate in the serene atmosphere at Washington National Cathedral, then contemplate the long history of Arlington National Cemetery, and then examine the collection at National Air and Space Museum. On the next day, explore and take pictures at Antietam National Battlefield. For traveler tips, other places to visit, reviews, and tourist information, you can read our Washington DC planning app . The Route module shows you all the different ways you can get to Washington DC. In July in Washington DC, expect temperatures between 89°F during the day and 73°F at night. Wrap up your sightseeing by early afternoon on the 12th (Fri) to allow enough time to travel to Louisville. Kick off your visit on the 13th (Sat): examine the collection at Louisville Slugger Museum & Factory, sample the fine beverages at Kentucky Peerless Distilling Co, then Head underground at Louisville Mega Cavern, and finally try your luck at Churchill Downs. To see traveler tips, reviews, where to stay, and other tourist information, read Louisville trip planner . Traveling by flight from Washington DC to Louisville takes 4.5 hours. Alternatively, you can do a combination of train and flight; or drive. Expect a daytime high around 87°F in July, and nighttime lows around 69°F. Wrap up your sightseeing on the 13th (Sat) to allow time to drive to Nashville. Start off your visit on the 14th (Sun): get to know the fascinating history of Bicentennial Capitol Mall State Park, tour the pleasant surroundings at Centennial Park, then examine the collection at RCA Studio B, then get engrossed in the history at Lotz House Museum, and finally find your balance on the water with some of the best stand-up paddleboarding in the area. For ratings, reviews, where to stay, and other tourist information, you can read our Nashville journey planner. Traveling by car from Louisville to Nashville takes 3 hours. Alternatively, you can take a bus; or fly. You'll gain 1 hour traveling from Louisville to Nashville due to the time zone difference. July in Nashville sees daily highs of 90°F and lows of 70°F at night. Finish your sightseeing early on the 14th (Sun) so you can drive to Memphis. Kick off your visit on the 15th (Mon): pause for some photo ops at National Civil Rights Museum - Lorraine Motel, appreciate the extensive heritage of Beale Street, look for gifts at Memphis Music, then look for all kinds of wild species at Overton Park, and finally meet the residents at Memphis Zoo. To see photos, traveler tips, more things to do, and tourist information, refer to the Memphis tour itinerary planning site . Traveling by car from Nashville to Memphis takes 3.5 hours. Alternatively, you can take a bus; or fly. In July, daytime highs in Memphis are 91°F, while nighttime lows are 74°F. Wrap up your sightseeing by early afternoon on the 16th (Tue) to allow time for travel to Austin. Start off your visit on the 17th (Wed): identify plant and animal life at Congress Avenue Bridge / Austin Bats, then take in the natural beauty of Barton Springs Pool, then admire the landmark architecture of St. Mary's Cathedral, and finally contemplate the long history of Texas State Capitol. To find ratings, maps, more things to do, and tourist information, refer to the Austin tour itinerary planner. Traveling by flight from Memphis to Austin takes 4.5 hours. Alternatively, you can do a combination of flight and car; or drive. While traveling from Memphis, expect a bit warmer days and about the same nights in Austin, ranging from highs of 98°F to lows of 75°F. On the 18th (Thu), you'll travel to Albuquerque. On the 19th (Fri), take in the dramatic natural features at Petroglyph National Monument, pause for some serene contemplation at Capilla de Nuestra Senora de Guadalupe, and then get to know the fascinating history of Albuquerque Old Town. To find where to stay, photos, maps, and more tourist information, you can read our Albuquerque trip planner . Getting from Austin to Albuquerque by flight takes about 4.5 hours. Other options: drive; or take a bus. The time zone difference when traveling from Austin to Albuquerque is minus 1 hour. Prepare for a bit cooler weather when traveling from Austin in July: high temperatures in Albuquerque hover around 91°F and lows are around 67°F. Wrap up your sightseeing on the 19th (Fri) to allow time to travel to Page. Antelope Canyon has been added to your itinerary. On the 20th (Sat), have fun at Gunfighter Canyon, steep yourself in history at Navajo Bridge, explore the activities along Marble Canyon, then take in the dramatic natural features at Horseshoe Bend, and finally explore the stunning scenery at Antelope Canyon. Get ready for a full day of sightseeing on the next day: surround yourself with nature on a nature and wildlife tour. To find ratings, more things to do, reviews, and more tourist information, read Page holiday builder site . Getting from Albuquerque to Page by flight takes about 4.5 hours. Other options: drive; or do a combination of shuttle and flight. Expect a bit warmer temperatures when traveling from Albuquerque in July; daily highs in Page reach 98°F and lows reach 73°F. Wrap up your sightseeing on the 22nd (Mon) to allow time to travel to Salt Lake City. Start off your visit on the 22nd (Mon): get a new perspective on nature at Natural History Museum of Utah, then take in breathtaking views at Big Cottonwood Canyon, and then contemplate in the serene atmosphere at Temple Square. For photos, ratings, maps, and more tourist information, refer to the Salt Lake City trip maker app . Traveling by flight from Page to Salt Lake City takes 4.5 hours. Alternatively, you can drive; or do a combination of shuttle and flight. Expect a daytime high around 95°F in July, and nighttime lows around 70°F. On the 23rd (Tue), wrap the sightseeing up by early afternoon so you can travel to Yellowstone National Park. 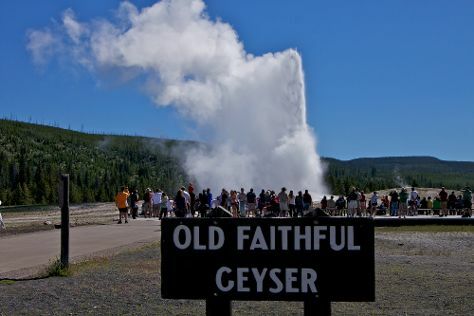 Start off your visit on the 24th (Wed): witness a stunning natural landmark at Upper Geyser Basin, witness a stunning natural landmark at Castle Geyser, then take in the natural beauty of Old Faithful, and finally take in the natural beauty of Grand Prismatic Spring. Get ready for a full day of sightseeing on the 25th (Thu): get to know the fascinating history of Uncle Tom's Trail and then trek along Artist Point. To see photos, traveler tips, and other tourist information, read our Yellowstone National Park day trip tool . Do a combination of flight and car from Salt Lake City to Yellowstone National Park in 3.5 hours. Alternatively, you can drive; or do a combination of flight, shuttle, and car. Plan for cooler temperatures traveling from Salt Lake City in July, with highs in Yellowstone National Park at 73°F and lows at 39°F. Wrap up your sightseeing by early afternoon on the 25th (Thu) to allow enough time to drive to Bozeman. Bozeman is a city in and the county seat of Gallatin County, Montana, United States, in the southwestern part of the state. To see traveler tips, where to stay, more things to do, and more tourist information, go to the Bozeman online vacation planner . Traveling by car from Yellowstone National Park to Bozeman takes 3.5 hours. Alternatively, you can do a combination of car and bus; or take a bus. Expect somewhat warmer temperatures when traveling from Yellowstone National Park in July; daily highs in Bozeman reach 86°F and lows reach 50°F. You will leave for home on the 25th (Thu).